A play about life’s choices. Journey with two friends who discover how precious life is from its first beginning…to the very end. 2 hours on 4 audio CDs. Act 1. Andrew Ross is a high school student with Down Syndrome who overhears best friends Robert and Emma insulting people with disabilities during a conversation about abortion. When Andrew risks his life to help Emma, she discovers a new understanding of happiness, quality of life, love, and friendship. Act 2. After a classroom discussion about the personhood of the unborn, Robert learns that his mother has just suffered a second-trimester miscarriage. Traumatized by the news and haunted by a secret he has been carrying, Robert searches for hope and forgiveness. Act 3. When Emma is invited to apply for a scholarship to one of the most prestigious law schools in the country, she jumps at the change to argue against Roe v. Wade in the interview stage. But she faces an unexpected and life-changing trial when she learns that not everyone appreciates her arguments. Act 4. 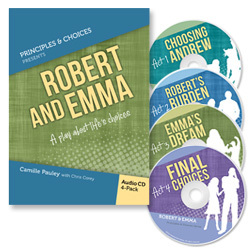 Now in their early 30s, Robert and Emma embark on the greatest journey of their lives when a terminal illness challenges them to broaden their own understanding of suffering, compassion, and the true meaning of life.